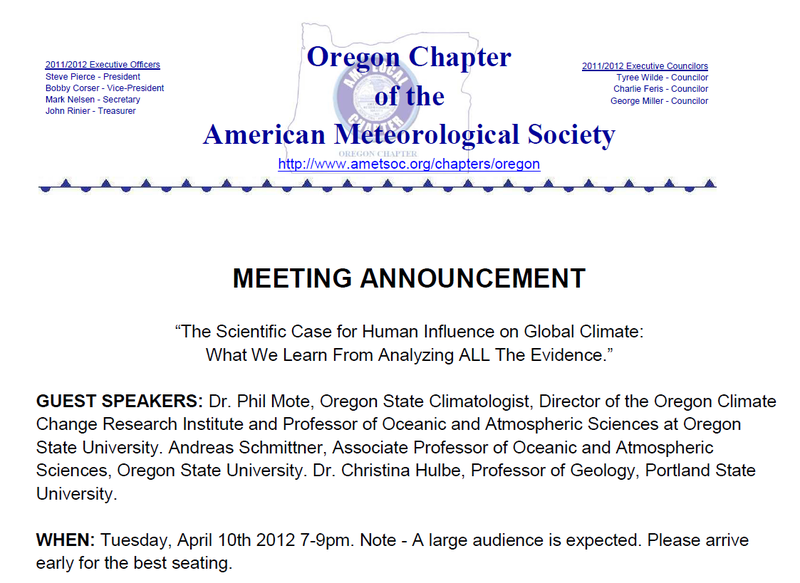 Tonight at Portland State University is the next round in the man made global warming discussion sponsored by the Oregon Chapter of the American Meteorological Society. But don’t expect any fire works there. No, I’m pretty sure those have occurred in the emails leading up to tonight’s speech by head warmist Phil Mote. The friction comes from man made global warming skeptics fighting for room in the public debate. They fought for time in an AMS meeting which was BANNED BY OMSI (see previous posts here, here, and here). Now the skeptics want to be heard at this latest presentation by the pro man made global warmists. It involves a snit fit between Astrophysicist Gordon Fulks and members of the AMS board including Steve Pierce and KPTV weatherman Mark Nelson. You have been friendly to me in person, and hopefully you feel I have been friendly back to you the couple of times we have met. I will continue to be polite and friendly when I see you again. Why did I block you? Your constant personal attacks on our AMS Executive Board, George Miller, Steve Pierce, and just about anyone that doesn’t agree with you became tiring. In fact your very first email, maybe two years ago, attacked me along with Matt Zaffino for promoting a global warming agenda on television. How many times do you think I’ve mentioned global warming on air in the past 5 years? I don’t think I have! You were just making that up to support YOUR agenda. I see that pattern continuing even through this weekend’s emails. After offering a conciliatory message to all involved in the battles over the upcoming Oregon AMS meeting, President Steve Pierce received a message from one of his fellow Board members (Mark Nelsen) and completely lost his composure. Below you will see him kissing me off – one last time – and suggesting that perhaps I should be barred from the meeting tomorrow night! This is bizarre behavior from the president of a professional society. P.S. In light of the scathing email that Dr. Fulks sent out last Friday, several long-standing and well respected AMS members, who coincidentally side with Dr. Fulk’s view on climate change, have asked that he be barred from entering Portland State University tomorrow night. I’m not sure this is necessary, but thought it was worth noting none-the-less. Suffice it to say that the Doppler shows a storm brewing. Light Rail Vote HiJacked By Couv Council: Throw the Voters From the Train! How far in the tank are the Vancouver City Council for the Light Rail Mafia? All the way, baby. In fact, they’re so in the tank for the process that they VETOED any democratic vote by taxpayers in Clark County on what will turn into hundreds of millions of dollars in future costs. That’s the net effect of their vote last night. Four councilors voted in favor of a motion to oppose advancing a sales tax vote “until all other funding options have been evaluated and discarded as not viable.” Voting in favor were: Mayor Tim Leavitt and Councilors Jack Burkman, Larry Smith and Jeanne Harris. Councilors Bart Hansen, Jeanne Stewart and Bill Turlay voted no. That means that even if the C Tran Board votes today to allow an election supporting the costs of light rail, the City Council vote will block it. That’s because the Council knows what the result of the vote would be. Remember now, the City Council is in the minority here. 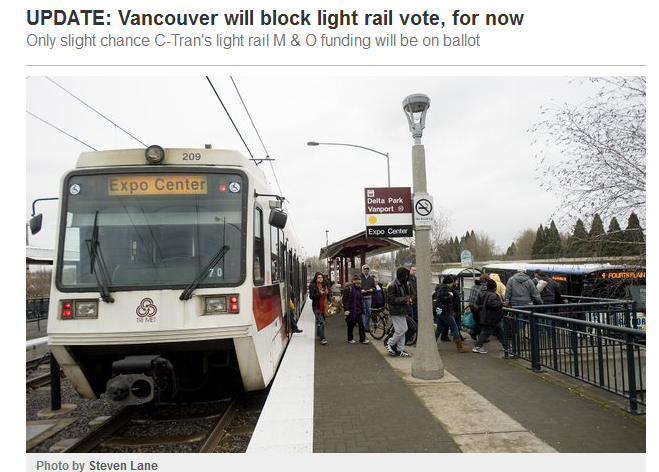 A majority of the nine C-Tran board members, including the three-man Clark County Board of Commissioners, who also have veto power, have said they favor a broad public vote in November asking residents to help pay for light rail in Vancouver. The City Council vote last night is even more head shaking considering that the Columbia River Crossing project looks evermore like a Zombie project as more and more opposition to the mega bridge is heard. Don’t be fooled. The only tax increase to be used for light rail that must be referred to the ballot are the additional sales taxes. The City Council, lead by flip flopper Mayor Tim Leavit, say they want to pursue other ways to fund light rail–that don’t have to be referred. When election time rolls around and they say they voted to stop a tax or some such jive, you’ll know the truth. What? Gas prices per gallon average $1.61 when the G-4-3 left office and he hasn’t been in office in three + years, so why did the Washington Post ask this question? There are all kinds of flaws in this poll. See a story about the D+11 advantage in the poll and how it’s of random Americans, not likely voters here. But asking this question is a whopper! 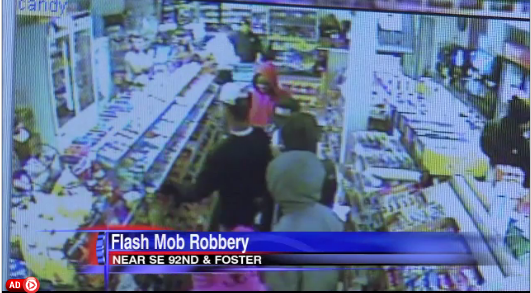 Sixteen kids stormed a SE Portland Chevron convenience store at 92nd and Foster and picked off who knows how many items before being chased off with a baseball bat. 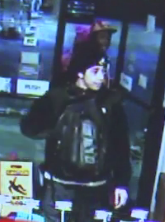 The story was even linked to the Drudge Report this morning. 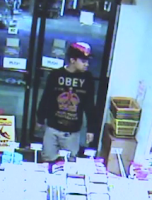 Carlos Garcia was working the store last Saturday night when about 16 kids filed into the store in succession and systematically started ripping off items in the store. 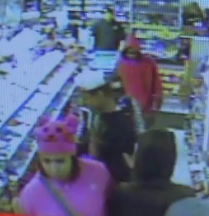 Some of the kids were so bold they carried items in their hands as they walked out of the store. They even came back but Garcia is seen on the surveillance tape chasing them off with a baseball bat. 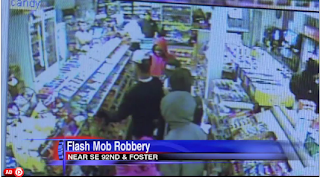 Flash mob robberies are becoming more common. Nearby see the rogue’s gallery of some of the kids involved. Do you know any of them?